Well you’re in luck because this wild-looking vehicle will offer you that privilege for a mere $500. As you see from the video below, the vehicle offers a graceful and tactful way to skip across a pond like a huge freak, bouncing around on a flimsy-looking hydrofoil thinger that will inevitably cause you to flip over and spill your beer. If you stop jumping, eventually, you will end up in the water. Not so bad on a hot, sunny day! 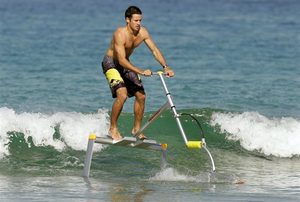 In order to keep the AquaSkipper up out of the water, the rider needs to either be jumping on the platform or riding a wave. A rider can glide for small amounts of time, but then needs to start jumping again.